The Alexa voice assistant has become synonymous with voice-controlled smart speakers around the world in just a few short years. If you want to find out why, then take a look at our roundup of the best Amazon Echo prices. If there are any Amazon Echo sales or deal promos from your favorite retailers we'll find them for you and post the latest information on this page thanks to our price comparison technology. This is a great time of year to keep an eye out for a price-drop too, as you're more likely to see prices drop as we get closer to Christmas. There are lots of different Echo speakers and screens out in the wild now, with Amazon recently refreshing its entire lineup with improved 2018 versions. The diminutive Amazon Echo Dot deals are a popular choice all year round as it's one of the most affordable smart speakers on the planet. We've got prices for the larger versions too including the Amazon Echo, Echo Plus and the new Echo Sub (a subwoofer accessory). 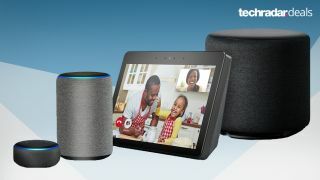 If you want a visual element too, then we've got you covered with both the old and new versions of the Amazon Echo Show or the bedside table -friendly Echo Spot, all of which include a screen. Although Amazon designed and built these smart devices, they're actually on sale at a large number of stores, which means they're never far away from a discount. We'll also list the regular retail price (RRP) of each of these Amazon Alexa-powered speakers so you can get a better idea of how good the latest prices in the comparison charts are. If prices are clinging to the RRP, just wait a while as cheaper Amazon Echo prices are always around the corner. Amazon Echo not to your liking? Check out these great Google Home prices. Amazon Echo Dot (3rd gen) RRP: $49.99 / £49.99 / AU$79. The new 3rd iteration of the Echo Dot is out now. It comes in three colors, charcoal, heather grey, and sandstone (that'll be black, grey or white to the rest of us). The hockey-puck-shaped speaker has a more refined look with a fabric finish this year. However, the speaker driver is much larger, going from a 1.1-inches in diameter to 1.6-inches It's 70% louder than the previous version and keeps the aux 3.5mm connection for a physical speaker output. You can also connect it wirelessly to external speakers via Bluetooth. We've rounded up all the current deals available for the new Echo Dot below, but be sure to check back as we'll add more prices as they become available at other retailers. Amazon Echo (2nd gen) RRP: $99.99 / £89.99 / AU$119. The Amazon Echo is the firm middle ground of the alexa family with a more powerful speaker than the Echo Dot. This second generation version is a bit shorter but houses an upgraded speaker powered by some neat Dolby processing. This is the 'just right' option in the Echo lineup. It's not as budget as the Amazon Echo Dot nor is it as premium as the Amazon Echo Plus. It's the one to go for if you're going to use the smart speaker a lot to play music but want to keep prices down. If you just want a smart speaker to boss around and make your home smarter, you might as well save a bit of cash by getting the Echo Dot instead. Amazon Echo Show (2nd gen) RRP: $229.99 / £219.99 / AU$349. Amazon has released a 2018 update for the Amazon Echo Show, the Alexa smart speaker with a touchscreen. As things stand, it's a bit more expensive than the previous gen version. This version of the the Echo Show will phase out the older model soon enough and price-cuts and sales are never far away on Amazon's own devices in an increasingly-popular market for smart home devices. The updated Amazon Echo Show has a bigger screen, with louder speakers too, making it a much better fit for video content to be enjoyed via your Amazon Prime membership or for free on other channels. You can now also use it as a smart device hub for other devices like smart thermostats or bulbs, meaning you can save some space around your router's ports. The competition for screen-sporting smart smart speakers is heating up though, with the Google Home Hub also competing for your attention. Amazon Echo Plus (2nd gen) RRP: $149.99 / £139.99 / $229. Amazon revamped the Echo Plus smart speaker in late 2018. It now shares a similar look to the other Echo speakers, with fabric covering the body instead of a harsh plastic, which has improved the speaker's audio output too which we appreciated during video calls. The main advantage to the Amazon Echo Plus compared to the two smaller Echo speakers is the fact that there's a smart home hub built in. So if you have Philips Hue bulbs at home, you no longer need the Hue Bridge to work as the brain to control them via apps or Alexa voice-controls. This is great for controlling smart speakers and smart thermostats too - there's even a built-in thermometer for measuring room temperatures. The list of smart devices around our homes is growing constantly and the Echo Plus is ready for the future. Amazon Echo Spot RRP: $129 / £119.99 / AU$179. The Amazon Echo Spot is a miniature version of the Amazon Echo Show better suited to a desk or bedside table. The small screen is designed to show you little pieces of information rather than watch episodes of The Grand Tour or Mr Robot. But that might be more than enough if you just want to quickly check directions or read a news bulletin. It's very handy for video calls between other Amazon Echo screen devices too. Check out today's best Echo Spot prices below. Amazon Echo Sub RRP: $129.99 / £119.99 / AU$199. If you're going all in on the Amazon Alexa audio setup at home, then you'll want to take a look at the latest Amazon Echo Sub prices. The Echo Sub is not a smart speaker though, it's a subwoofer to connect to your other Echo speakers, so you'll need to pick up one of those (you're already on the right page for them!) if you don't have any yet. Or, check out some of the bundles available as Amazon has started selling the Echo Sub with a pair of regular Echo speakers in some regions to give you a full stereo sound setup at home. If you'd prefer to just have one beast of a smart speaker with a huge sound, then you may want to check out the latest Google Home Max prices instead - be warned, it's not cheap. Amazon Echo Dot (2nd gen) RRP: $49.99 / £49.99 / AU$79. The Amazon Echo Dot is the smallest of the Echo speakers. It manages to save this space by including a much smaller speaker, which consequently offers a quiter sound (but still louder than your phone). The good news is that if you want to do some serious music listening then you’re able to plug the Echo Dot into an external speaker using its 3.5mm jack. It’s also a great deal cheaper than the other Echo prices, meaning that it’s a great way of cheaply getting Alexa into your home, or perhaps adding a second speaker to your setup. Amazon Echo Plus (1st gen) RRP: $149.99 / £139.99 / $229. The now last-gen Amazon Echo Plus, was the bigger and better version of the 2017 Amazon Echo. It's actually similar in size to the original Amazon Echo, but next to its second generation it looks a lot taller. The difference between the Echo and the Echo Plus is the inclusion of slightly better speakers on the Plus, as well as a smart home hub that theoretically removes the need for other hubs to be plugged into your router to get different smart home devices working. It's generally a bit cheaper than the newer version now, but we expect stock to be slowly phased out now. Once stock becomes rarer, prices could go back up as third-party seller try to cash in. Until then though, take a look below to see if you could get a bargain. Amazon Echo Show (1st gen) RRP: $149.99 / £199.99. The original Amazon Echo Show will be phased out of stores pretty soon now that a new version is made available. You might be able to get a decent discount before they go though. Like its siblings, the Dot, the Plus and the Echo, the Show can play music, control your smart home and make calls to other Echo devices, but with the additional aid of a decent-sized screen. That display allows you to get visual information as well as audio. That means you'll be able to see the name of songs while they're playing, read recipes right off the screen, or see more in-depth five-day weather forecasts without asking Alexa to repeat herself time and time again.